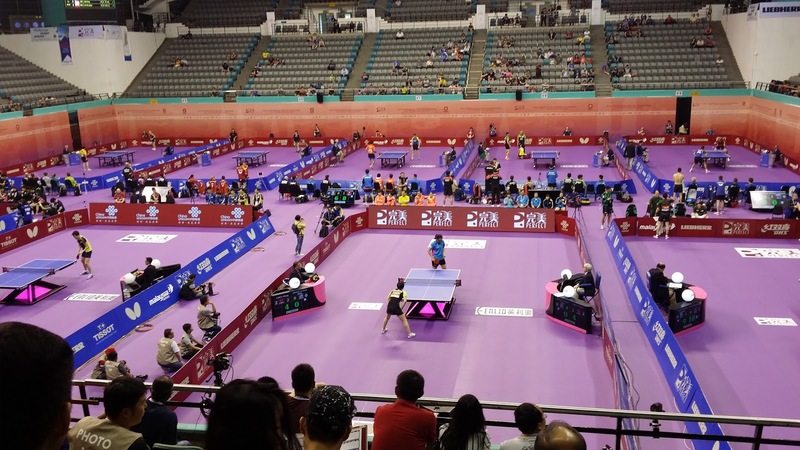 You'll notice things went pretty quiet after the end of the 2016 Perfect World Table Tennis Championships and there will be a blog post about that soon. Now that I have time (more of it than I would like) I felt like it was time to reflect on my trip to my first World Championships. There were some things which were great, some things which I didn't particularly like and some things that I learnt. Let's start off with the things I experienced which were great. This was a prime opportunity to catch up and meet with a lot of players I had started becoming acquainted with in the past couple of years. I took some time out to catch up with Werner Schlager who I hadn't seen since 2013. I also met up with Petr Korbel just before he left, the fighter Jean Michel Saive and spent some time with the very humble Vladimir Samsonov and Jorgen Persson who I had hung out with last year in Chengdu at the China Open. Being immersed among these professional players is a very valuable experience if you make the most of it. There were lots of matches on and plenty of chances to watch some great players up close and personal and of course to compete with them on occasion. One of the highlights for me was watching England play Japan in the semifinals, very exciting matches and great performances particularly from Liam Pitchford. What I Didn't Like about my first World Championships was the playing conditions, in fact for a World Class competition I found them baffling. Raised constructed floors over a carpark inside ventilated marquees was the last place I had expected to be competing. While the air inside was nice and the lighting was ok (still quite a lot of glare on the tables). The floor and bounce of the ball was very inconsistent because the floor was not solid. Some areas of the floor were firmer, some softer, some hollower. It made each table unique and difficult to adjust to in its own way. The match level was tough enough for me without these added obstacles so it was fairly hard to try and adjust to and I was far from confident in my ability to perform during my few matches. Another thing I couldn't stand was the sponsored crowd that were bought in from China. 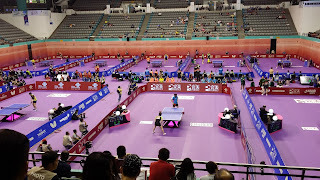 It was evident that these thousands of individuals were possibly clients from the sponsor company and had very little knowledge of table tennis. They were incredibly loud any time China won a point and I think it took away from the intensity of any good points because the crowd were just deafening the whole time. I actually ended up leaving half way through the men's final. It was a nice idea from the sponsor to try and fill the stadium but I think it created a kind of fake atmosphere. What I Learnt is probably the most valuable thing to come out of the competition. Essentially I learnt that given my current efforts I am not even close to competitive at the international level. While I only played 3 matches during the competition, it was enough to realise there are some major holes in my game. Serve Receive: While my serve held up against the players I competed with, my serve receive was anything but. I need to develop more initiative into serve receive and really work on trying to find more confidence using my backhand flip to receive serve. This was something our team coach also pointed out to me. You need to take the initiative at every opportunity. Often I found comfort in pushing long but this wasn't very effective and is something I really need to try and minimize in my game if I want to improve. Athleticism: While I had shots to compete with, I was seldom in position to use them. Athleticism has never been one of my strong points and I will definitely be revisiting my weight, strength and agility and also my flexibility when I return to training. More Matchplay: What I really need to focus on is more matchplay. I identified this as a significant problem for me prior to the World Championships and it was pretty evident when I played my matches that there was quite a lack of intensity and focus, I often went on long strings of losing points without really trying my absolute best to stop that from happening. This was particularly evident in my first match against Lithuania where I just leak points throughout the short match. Having achieved one of my major career goals I don't feel satisfied. I wasn't a key player in the team and only competed in 3 matches during the tournament and didn't perform the best I could have. This pushes me to try and focus on making the team again and being in a better position to compete in a strong position in the team. Revisiting my goals will be the first priority when I return to the USA at the end of this month. Thanks Matt. All good points. While athleticism is something of great value in any sport, one area that I can see a lot of improvement with a lot of players is physical training. I just got done watching Zhang Jike at Kuwait and as well as he played I couldn't help but notice his legs. Take a look at his legs sometime. He must run and lift. Running helps endurance and movement and lifting strength. I think we fall down on this a lot and may help you be in position. Best wishes.